Originally published on Indian Country Today Media Network and cross-posted here with their permission. 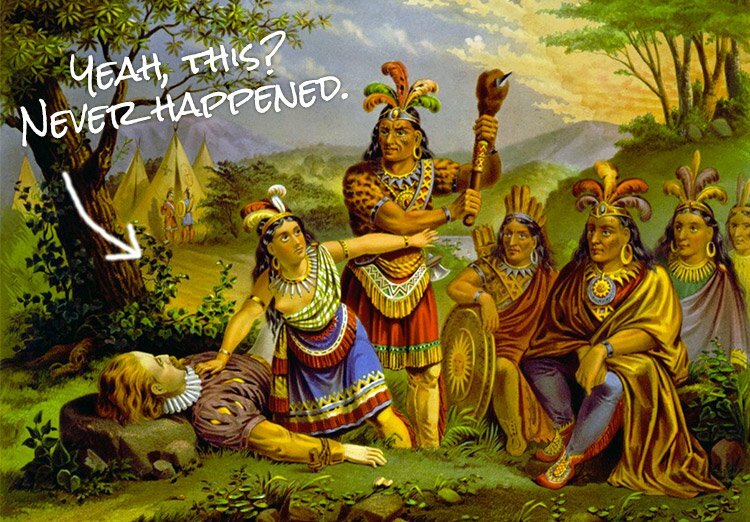 Do history books written by white folks tell the truth about Natives in the US? We think not. Here are just some of the things they fail to mention. In 1636, when a murdered man was discovered in a boat in Plymouth, English Major John Mason collected his soldiers and killed and burned down the wigwams of all the neighboring Pequot Indians who were blamed for the murder. For the next 100 years, every Thanksgiving Day ordained by a governor was in honor of the bloody victory, thanking God that the battle had been won. 4. What is a Redskin? A screen shot of Goldtooth’s Facebook page with the 1863 newspaper clipping and his comments that sparked discussion on Facebook. In the fall of 1862, Native tribes in Minnesota waged war on white settlers out of frustration from starvation, mistreatment and harsh conditions. After soldiers captured over 300 Indians, President Abraham Lincoln approved the largest mass execution in U.S. history on 38 Dakota men. On the day of their hanging, an estimated 4,000 spectators watched them executed. Their bodies were later taken and used as medical cadavers. From 1863 to 1868, the U.S. military persecuted and imprisoned 9,500 Navajo (the Diné) and 500 Mescalero Apache (the N’de). Living under armed guards, in holes in the ground, with extremely scarce rations, it is no wonder that more than 3,500 Navajo and Mescalero Apache men, women, and children died while in the concentration camp. 7. There Are 566 Federally Recognized Tribes in the U.S. When I was a student in high school, I learned that George Washington saw Indians in Virginia and possibly heard once or twice about the Cherokee Trail of Tears. But in 18 years of public school (and a few of private Catholic School) — not once did I learn about the multitude of tribes, languages or cultures involved in this country. Dr. Arica L. Coleman is the assistant professor of Black American Studies at the University of Delaware. She is African American and Native American (Rappahannock). Due to her ancestry, she has done a lot of thinking about the relations and interactions of Blacks, Indians and whites on the East Coast, primarily in Virginia. According to Coleman, who turned her Ph.D. dissertation into a book titled That the Blood Stay Pure, there was Indian slavery in Virginia. “The first slaves in the Americas were Native American and this business that the Native Americans died off as a result of disease and war [is inaccurate]—those were not the only reasons for their demise, there was the Indian slave trade, which is something we do not discuss a lot,” she writes. Similarly, William Loren Katz, the author of Black Indians has written how entire cities of blacks and Indians came together as a strong force against European settlers including huge factions of black Seminoles who created nearly impenetrable forces against those soldiers foolish enough to try and break into Florida, and suffered miserable defeats over several years. Vincent Schilling is the Executive Vice President and co-owner of Schilling Media, Inc. a Native American owned Media and Media Relations Corporation. He is an enrolled member of the St. Regis Mohawk tribe, an Award-winning Native American author and Short film Producer, an Award-winning Photojournalist and a Public Speaker that has traveled all over the United States and into Canada. He lives in Virginia Beach with his wife Delores. Together, they have traveled all over the country and Vincent has been fortunate to share his experiences with Native youth and others as far away from his hometown of Virginia Beach as Ronan, Montana. Follow him on Twitter @VinceSchilling.